clients' two great passions - the V12 engine and open-top driving. 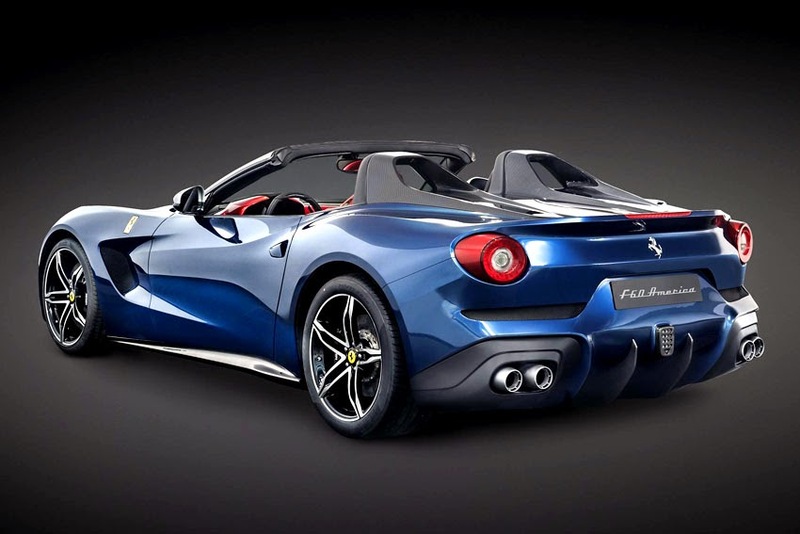 The F60America is powered by Ferrari's award-winning mid-front-mounted V12 which enables the car to sprint from 0-100 km/h in just 3.1 seconds. Powerfully muscular, the car is clothed in beautifully sculpted and exceptionally balanced volumes, honed, as ever, strictly to aerodynamic requirements in line with the marque's DNA. The F60America's personality is instantly clear from its flanks which are characterised by an innovative diapason design theme. The front of the car is dominated by the classic Ferrari single front grille with chrome finish and integrated air intakes for the brakes. The cabin's asymmetrical design highlights the driver's area with sporty red trim, while the passenger side is black, inspired by the historic Ferrari competition cars. The cabin trim is exclusive with the dash, tunnel and door panels on the driver's side all swathed in composite materials. The racing seats also feature a stylised American flag motif on the centre of each seat and backrest. The F60America's bodywork adopts the classic North American Racing Team livery, and the special Ferrari 60th anniversary Prancing Horse badge on the wheel arches also appears on the tunnel in the cabin.